Have you been checking out Kodansha Comics’ digital-only and digital-first releases? I have, and I love this initiative: it lets me sample dozens of series that might otherwise never see the light of day in North America. Rugby manga. Karuta manga. Really weird horror manga. Medical drama. Josei. As you might expect, there’s a good reason why no one was clamoring to bring out print editions of, say, Deathtopia, but lurking among the pedestrian, the awful, and the amateurish are gems such as Dragon Head, PTSD Radio, Shojo FIGHT! and Tokyo Tarareba Girls. This week, I previewed one of Kodansha’s most recent digital offerings, Starving Anonymous, which, according to Kodansha’s editorial staff, is “an intense dystopian horror thriller in the apocalyptic vein of Dragon Head and Attack on Titan, from the team that brought you zombie actioner Fort of Apocalypse.” Translation: violence ahoy! Imagine an Eli Roth remake of Soylent Green in all its gory, sadistic intensity, and you have some idea of what it’s like to read Starving Anonymous, a manga that strives for topicality but settles for cheap thrills. Like the 1973 Charlton Heston film, Starving Anonymous takes place in a heat-ravaged future where supplies are scarce, birth rates are plummeting, and people are crowded into fewer and fewer cities. The series’ protagonist is I’e, a normal high school student whose life is violently upended when he’s snatched off a bus and deposited at an enormous industrial facility where the main product is — you guessed it — people. A concept this potentially repulsive lives or dies by the thoughtfulness of the execution, and it’s here where Yuu Kuraishi and Kazu Inabe stumble. The writing is efficient but artless, establishing the direness of the world’s condition through news flashes and pointed conversations but revealing little about I’e; he’s more a placeholder than a character, a collection of reaction shots in search of a personality. The artwork, by contrast, varies from slickly generic — Tokyo apparently looks the same 50 years from now — to willfully ugly; once inside the factory, Inabe draws rooms and conveyor belts filled with distended bodies, rendering every roll of fat and bulging eye in fetishistic detail. If Kuraishi and Inabe were trying to make a point about the ethics of factory farming, or the evils of overconsumption, that message is quickly shoved aside in favor of a more conventional escape-from-prison plot in which I’e and a group of young, healthy rebels fight their way to the outside. 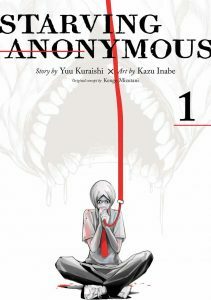 Nothing in the first chapter suggested that Starving Anonymous has anything on its mind other than characters doing and seeing horrible stuff, so I’ll be passing on this one. Imagine if you will, an image of two goats looking at each other. Maybe a younger animal looking up at an older one. “The younger, cuter one is looking up at the older and wiser one,” your brain immediately fills in for you. You then tell yourself a story about how the older goat is teaching the younger one, or scolding it, or… And in the end, you have created meaning in what is a picture of two animals who are literally just looking at one another for one brief moment… Ravina The Witch? by Junko Mizuno is the fairytale equivalent of two animals looking at one another. We can be moved deeply by the story and we can find all sorts of meaning in it – whether it is truly there or not. Thanks again for posting my reviews especially happy to see my review for Wake Sleeping Beauty Volume Three posted as Kodansha Comics even saw fit to Retweet it.